We will be opening the gates of Rolling Thunder Cherry Ranch this coming weekend, Memorial Day 2016. Open for you and your family to come pick cherries. + visit the farm animals. + take some souvenir photos. Feel free to bring a picnic. We will have Local Honey and Cherry Lavender Sweet Tea for sale. See our FAQ page before coming. please let me know it’s good time and cost. Unfortunately we won’t be ready for cherry picking memorial day 2017 weekend. We will most likely open the second weekend of June. When are you open for 2017? Tentatively opening up the orchard for u-pic cherries the beginning of June. It will be a very limited crop this year. How is that crop looking this season (2018)? What is the availability and pricing? Crop looks good so far. Its still to early to pin down an exact date of opening for the 2018 season. Most likely mid-June. We will make a post here when we have a set date. 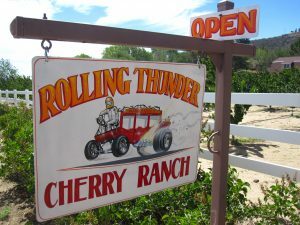 Please feel free to follow our facebook page for up-to-date inforomation Rolling Thunder Cherry Ranch on facebook.